The Relentless Reader: Knock it off would ya?? Knock it off would ya?? Listen folks, when I'm reading I don't even hear you. Eventually I might sense an annoying presence nearby and look up. By that point I'm pissed because, because SHUT UP. And they are upset because I didn't hear them or respond in a timely manner. Don't Bug Me When I'm Reading! Do you have any bookish pet peeves? What are they? I haven't thought about it that much until now, but I would like to find a copy of that bookmark. And I guess one of my own. Do not write a story in a trilogy that could easily have been summed up in one book deal. Not only can I read well, I am sort of smart too. Pretending you have a trilogy when you just want more of my money bugs me. 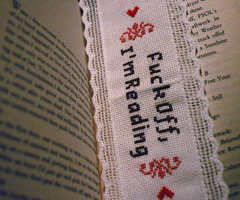 I love that it's needlepoint and lacy, ha ha. Great peeve. I'm seeing that a lot, in the movie industry as well. Argh. My husband says I go into "book mode" and he and the girls can't get my attention or a reply. I totally understand. Why oh why don't they understand that book mode is a good thing? ;) Just leave us alone when we are in that fabulous place! I too am totally with you on the being disturbed while reading thing. That book mark is priceless! How about "Please return the books I lent you!". One of my friends has had two of my favorites for almost a year! I love to share books, but I like to get 'em back! I'm very wary of loaning books out, unless I don't care if I get them back ;) I wonder if a tracking device would be appropriate? Nope, I do wish I knew how to make those though! Thanks for stopping by! 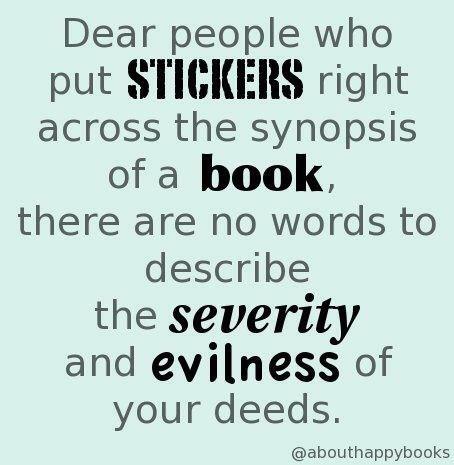 The stickers are the works of evil geniuses trying to ruin your life. "I'm pissed because, because SHUT UP." -lol. How does no on get that yet? Hi Adriana! I know just what you mean, I'll talk to anyone but if they have a book in their hand I try very hard not to, lol. I won't judge you..unless you bother ME while I'm reading, ha ha! I have been in book mode a bit too much lately! Oh this made me laugh a lot. I hate television or cinema tie-in book jackets. And lending books out and not returning them. 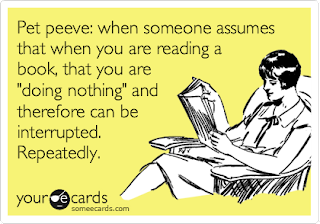 And being interrupted while reading - this is particularly bad in my husband's family as they are all newspaper people, which is a form of reading better suited to constant interruption. But they are also all talkers, while I am more of a listener, and I realise they are managing to get their papers read while I am completely in a dither, not knowing if I dare start on the same paragraph for the nth time!! I refuse to buy/borrow books with those awful movie covers. Blech! Oh, I so agree with you about how everyone thinks you are "doing nothing" when reading! Even on a plane, when you put up your book to protect you from the gabby person in the next seat, they are clueless. A sign on our foreheads, perhaps? I don't understand people who view reading as "doing nothing" WHAT?? What is wrong with you? ?